After making an entire quilt of Outlined Plus blocks, you’d think I’d be sick of them, but I’m not. They are just so fun and such a different take on a plus block. 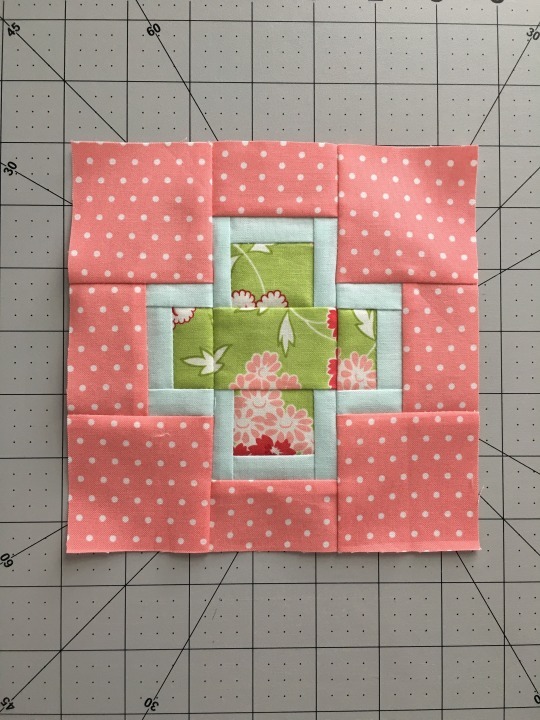 I did the math to shrink this block and have loved having something so striking in my sampler. I have spoken with Cheryl of Meadow Mist Designs and she gave me permission to share the cutting instructions IF you already own the pattern for either the stand alone quilt block in Quiltmaker’s 100 blocks volume 11 or her quilt pattern available in her Etsy shop. If this is you, please shoot me an email jen@heritage-threads.com and I’ll get you the cutting instructions. This is not in an attempt to sell a bunch of her patterns, but in an attempt to not share her pattern information without giving her the credit she deserves for designing this. Please choose to be honest and not request the cutting instructions (which are literally only that CUTTING instructions) without owning the pattern. You’ll need it for assembly instructions as well as I will only be providing cutting instructions. How many times can I say cutting instructions in one post?? Apparently at least 4.